Let’s be clear about one thing right from the beginning: Plastic Man and the Freedom Fighters #1 was not what I was expecting. But that isn’t necessarily a bad thing. If you picked up this book thinking you were going to get the wisecracking Plas, the hyperactive hero no one — including himself — takes seriously, you were in for a surprise. This isn’t about Plastic Man as comic relief; this is Plas during wartime. That’s something important to keep in mind, and a realization I had to come to myself reading this first installment of the two-issue mini series. 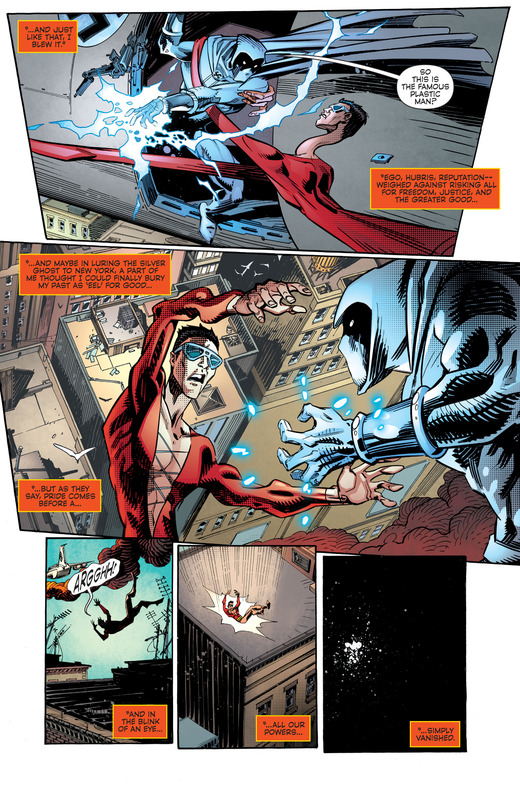 Plastic Man and the Freedom Fighters, at least in this first issue, is less of a superhero comic and more of a war comic. And in the context of a story set on Earth X — where the Nazis have won and New York is a city under fascist control — it makes sense. 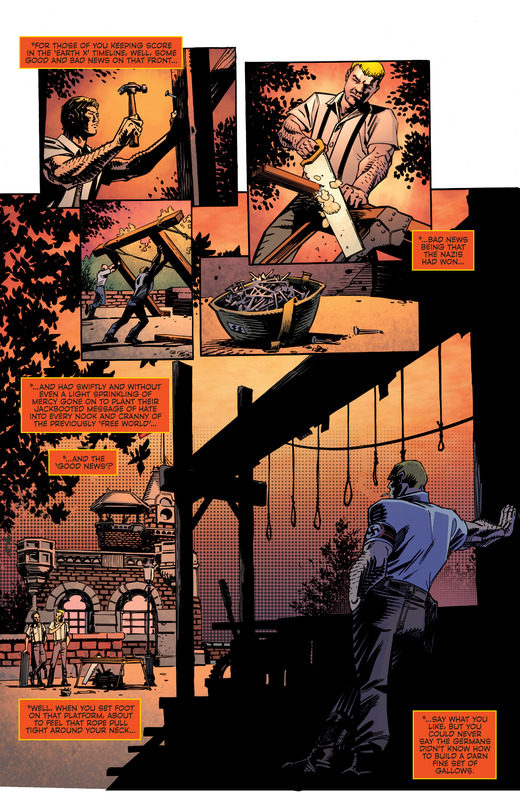 Written by Simon Oliver, with art by John McCrea, the story sets the scene and tone early, with Nazi soldiers building a gallows for the captured and de-powered Freedom Fighters, who in this iteration seem to be led by Plastic Man. This is in spite of the presence of Uncle Sam, who usually fronts the Fighters, and it’s these kinds of small details (Plas makes an overt reference to Earth X on the first page, for instance) that make me wonder if, instead of a return to the Silver and Bronze Age versions of these characters we’re getting yet another, slightly different take. Is this the Plas who left Earth 2 to fight on Earth X, now gone native and burned out by the rigors of war? Or is this a Plastic Man who actually is native to this Earth, a hero the others have rallied around? I have no idea, and we’ll have to wait until the second issue to see if there are any answers. Set against the opening backdrop of the gallows we also get narration from Plastic Man himself, a device used — sometimes ponderously — throughout the story, itself told mostly in flashback. The plot centers on a failed attempt by the Freedom Fighters at taking out a super-powered Nazi called the Silver Ghost. After losing their powers thanks to a Convergence dome suddenly appearing over the city, the Freedom Fighters barely escape and start living a life that’s even more underground than before, with Plas forced to return to petty crime just to keep the team fed. Soon enough Plastic Man (now going by his old alias of Eel O’Brian) is trying to keep the underground movement going by buying guns from an old friend, who cynically betrays him to the Nazis. Somehow this leads to all of the Freedom Fighters being rounded up, though we’re not shown how, and this takes us back to the beginning, with the Freedom Fighters shackled in a prison and listening to soldiers preparing for the hanging. But at the last moment, the heroes regain their powers and bust out, just in time to hear a booming voice in the sky announce that the convergence has begun and “only one city shall survive” — setting up next issue’s appearance of the Future’s End super-bots. I have to admit to having mixed feelings about Plastic Man and the Freedom Fighters #1. The work by both Oliver and McCrea is solid, but both also feel rushed in places — an unfortunate consequence of having only two issues in which to tell what could be, and probably should be, a much more complex story. I kept getting the sense that there were ideas planted here that would never see fruition, and as a reader that made the whole thing oddly unsatisfying. The short run forces the creators to front-load the first issue with a lot of exposition and scene-setting, so I’m hopeful that the second issue will be less clunky. McCrea’s art is great for the street-level action, and he consistently turns in some of the best reaction shots, but I’m not sure a book featuring Plastic Man is the best fit for his style. Many of the super-powered scenes almost seem static and, most disappointingly, Plas’ powers are barely on display. For a character who can literally take any shape that can be thought of, it was a let-down to see him only stretch like some kind of Mister Fantastic or Elongated Man. Shape-changing is Plastic Man’s defining characteristic — too essentially ignore it seems like an surprising oversight. You might notice that Plastic Man is getting most of the attention here. That’s not just because this is a Plas-centric site — the Freedom Fighters just aren’t given much to do in this issue. There is very little action for the team, and even less dialogue or characterization. I understand that Plastic Man is the headliner for the series (wow, that feels good to say), but I still would have liked to have seen more from the Freedom Fighters. Instead, the story here could have been told just as easily without them included at all. Again, this could all change next issue, but for now there are a lot of characters being overlooked in what is ostensibly a team book. As negative as all this might sound, I really did enjoy this issue, especially once I wrapped my mind around the concept of it being a war book. Is it a wacky, hijinks-filled good time? Nope. But it is an original, interesting take on Plastic Man as a hero, on his criminal past, and his struggle to resolve the two against the backdrop of wartime occupation. It’s ambitious and digs into aspects of the character that are often left unexplored. We’ll have to wait to see if the second issue delivers on that promise. Plastic Man and the Freedom Fighters #2 will be on sale May 27th!